The cities of California are endlessly charming, aren’t they? But sometimes you just have to get off the cement rock and into the elements—the soul-restoring green of the seaside hillsides, and the mist on your face of not just an ocean, but a beach. Aptos is just the ticket. Heading down Santa Cruz way on a particularly busy beach weekend can be truly overwhelming—tourists both local and international have discovered the Santa Cruz and Capitola summer hotspots. But even on the busiest weekends Aptos is largely unpopulated, or at least enough so that no crowds will bother you. Drive early though: you don’t want to get caught in noontime traffic over Highway 17. Aptos is just south of Capitola, off of a small State Park beach drive. There are two centers really, one little hamlet just up from Seacliffe State Beach, and another a little farther south where historical buildings—think: hundred-year-old plank sidewalks from the days when horses hitched to hitching posts—line the narrow road. These streets have been rejuvenated into hipster dining spots and darling little shops. It’s easy to get to Aptos: drive over the Santa Cruz Mountains on Highway 17 and spin south on Highway 1, then exit on State Park Drive. Though there are several little motels and nearby rentals, it’s just as easy these days get an Airbnb or Vrbo rental in Aptos proper. Or, if you’re trying to get as near to the beach as you can get, there are several reputable rental companies just near the water that supply dozens and dozens of beachfront property rentals. For house rentals, search for Bailey Properties, Cheshire Rio Properties and Bradford and Associates Real Estate on Rio del Mar Beach. The state beach is simple and lovely, and when all the other tourists are jammed into the nasty traffic jam that Capitola’s Esplanade has become, you’ll be in the sweet serenity of open sand, bright blue water, and no crowds. A favorite beach in Aptos is little Rio del Mar beach, a bit further south, and just under the old trestle railroad tracks below the old town. A tiny flat parking lot opens into a wide expanse of beach and summer houses. This spot is usually protected from the wind on summer days, and is as scenic as can be. While parking can get a bit crowded in the small parking lot, there are plenty to of places to park on the side streets. Bring a lunch, a beach towel and an umbrella, or stop at Pixie’s Deli for amazing sandwiches, deviled eggs and simple salads. Grab a beer and a sandwich on Dutch crunch and from there it’s a quick step onto the sand. If you are looking for a little more upscale fare and it’s dinner hour, head right over to Café Rio, which faces both the sand and the sunset, and fries up lovely fresh seafood, salads and other delicious dishes. Just off State Park Drive, in the little hamlet north of Rio del Mar, is the famous Marianne’s Ice Cream—a not to be missed, homemade, creamy dream of a dessert in dozens of flavors. Head across the street to Manuel’s, a tiny but authentic Mexican eatery that has some of the best enchiladas around. Just down the road from Manuel’s, on the same side of the street, local artists often set up their work in their driveways on weekends. It is a a sweet delight to enjoy the south of the border fair, grab a Marianne’s ice cream for dessert, and wander down the block to look at some lovely art. See Liz Lyon Friedman’s work at her garage on Saturdays. In the old town, don’t miss the new ultra-cool wine bar called Cantine. Tucked in a tiny little center across from the Starbucks, Cantine serves wine, beer and tapas, and has a sunny deck out back to sit and imbibe. Try the macaroni and cheese with toasted breadcrumbs, the baked gnocchi with Gorgonzola and rosemary, or the flank steak banderillas with pickled red onion. The not-to-be-missed eatery in Aptos is the simplest one: the Aptos Street BBQ – a casual, re-checked tablecloth place, offering every kind of smoked meat you can imagine. Everything is served with a side of chips and coleslaw, and a wild array of on-tap beers. Meanwhile, the Station serves grilled sausage, chicken, beef, and pork in both sandwich-style and dinners. Get there early, as they often run out of one thing or another. Chicken seems to go the fastest and by six or seven at night they can be sold out. 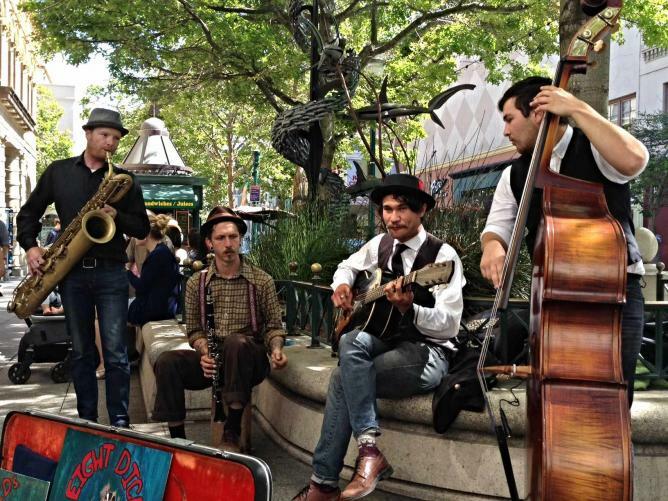 The Station always has live southern blues musicians playing to liven up your evening, and the musical quality is worth the visit all by itself. 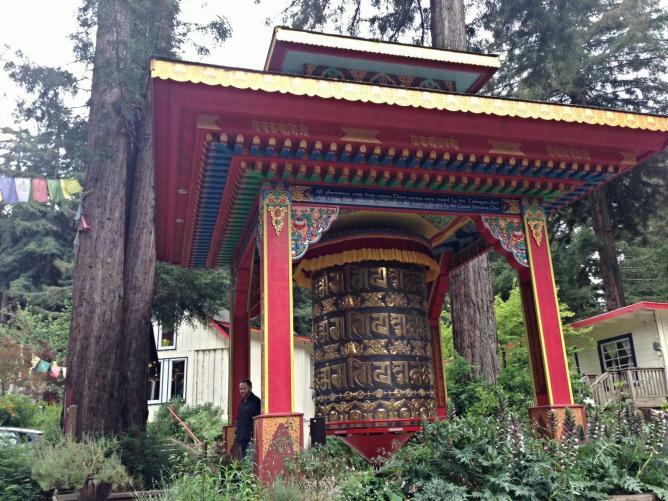 If you’re here for an entire weekend, then head right into the hills to the Land of Medicine Buddha in nearby Soquel. A retreat center set in the middle of the redwoods, it’s just a short ten minute drive from the beach. It’s free to hike here, and it’s lovely to hike the trails, take in the mossy wildlife, and ascend from prayer flags to more prayer flags, from wildflowers to redwood-circled sky views. Last but not least, wander back into the old town and have a lovely gourmet dinner at Café Sparrow. Housed in an old storefront, it feels like sitting in your great grandmother’s home. Delicate floral tablecloths and plank wood floors set the stage for food and wine. Try the roasted garlic, the Sparrow clams or the crab cakes for appetizers, calamari Picatta, the Bardot chicken cooked with pears, or their nouveau rendition of surf and turf—a petite filet mignon with dijon cream sauce, and two crab cakes with red bell pesto sauce. 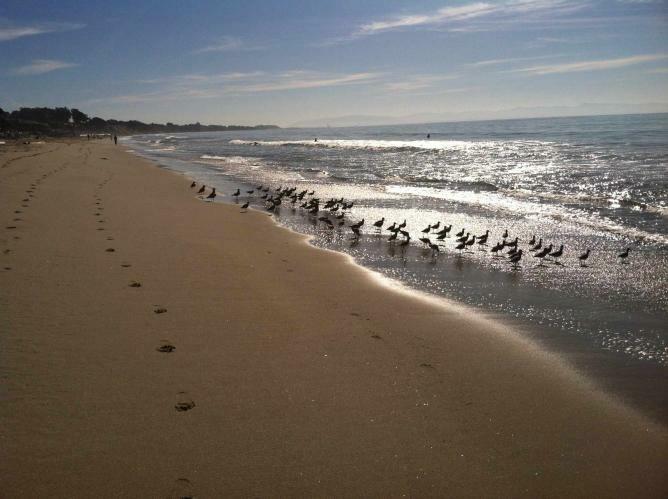 Yet the best part of your day in Aptos will always be heading back to Rio del Mar Beach and walking the length of the beachfront homes southward, splashing your feet in the easy waves, and watching the sun go down. The temperature drops quickly at sunset so definitely bring a jacket—but wind or sun, you’ll never find a better, more exquisite or serene slice of the Pacific coast. Aptos will fulfill your vision of a perfect beach weekend, without the inundation of too much humanity. It’s quaint, it’s cute, and best of all, it’s small. It will charm you with its old-time, picturesque and perfect beauty. And I guarantee you, you want to return again and again.